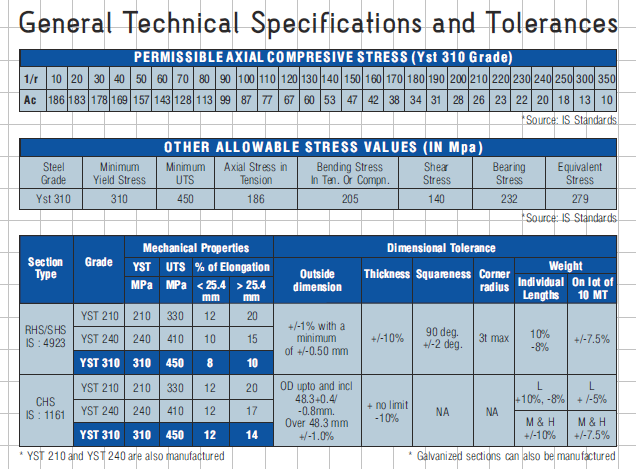 Please refer to the attached extract from Tata Structura steel brochure which states the mechanical properties of YST310. I have the following queries and would be glad if someone could share their knowledge with me. 1. Minimum yield stress (310MPa) and minimum UTS (450MPa) is clear. Why is the allowable axial stress in tension (186MPa), allowable bending stress in T or C (205 MPa), allowable shear stress (140MPa) and bearing stress (232MPa) less than the minimum yield stress value? 2. What is the difference between yield stress and equivalent stress? 3. Equivalent stress is given as 279 MPa. Is it correct to use the values given in point no. 1 in the formula "[(Axial stress)^2+3(Shear stress)^2]^0.5" to derive this value of 279 MPa? Thanks for rightly pointing out that working stress method has been used to calculate the allowable axial stress in tension (0.60*310=186MPa). I was trying to figure it out using the limit state method. The permissible stresses are not equal to Yield stresses in any case.For instance axial tensile stress in Working Stress method is 0.6*fy (310x0.6 =186 MPa). Even in limit state we restrict permissible stresses upto 0.87 fy.